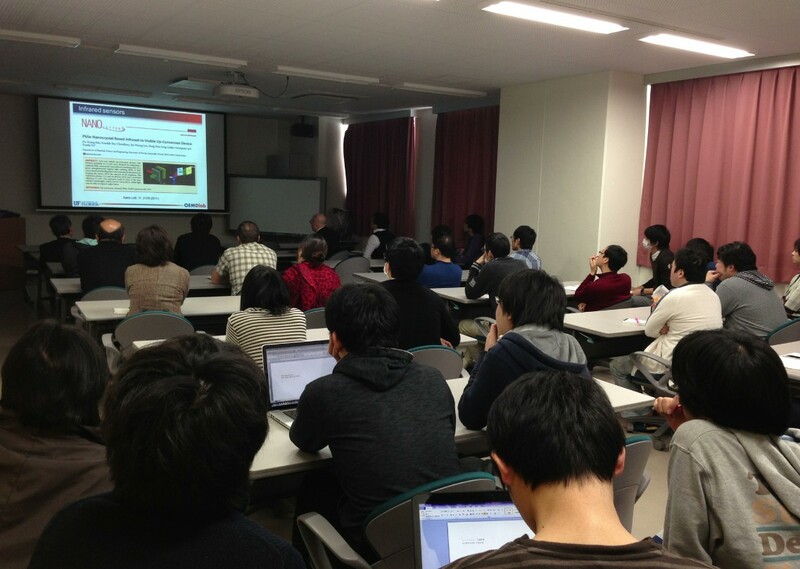 "The 55th ROEL Lecture Session" was held in the conference room on 4th floor in Research Center for Organic Electronics (ROEL) on March 4th. We invited Dr. Franky So from University of Florida as a guest speaker and he gave a lecture entitled "Energetic Disorder and Carrier Transport in Photovoltaic Polymers." 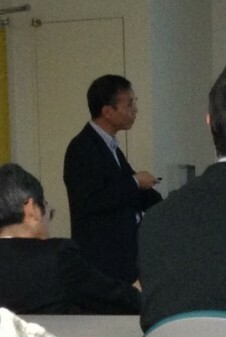 More than 50 students and researchers attended the lecture, and it finished in success. "Energetic Disorder and Carrier Transport in Photovoltaic Polymers"
Solution processable polymeric solar cells have drawn a lot of attention due to their potential for low cost roll-to-roll manufacturing. Compared with inorganic semiconductors, polymer semiconductors have relatively low carrier mobilities and therefore carrier transport is considered a limiting factor determining the performance of a polymer solar cell. In addition to carrier mobility, carrier lifetime in the polymer:fullerene blends is another important parameter determining the cell efficiency. We have extensively studied the carrier transport and recombination properties of several donor-acceptor conjugated polymers. We found that while low mobilities in polymers lead to charge imbalance, high mobilities do not always lead to high power conversion efficiencies. In this presentation, we will present our device results based on dioctyldithieno silole (DTS) polymers with a wide-absorption band and excellent transport properties. Even though the DTS polymers have a high hole mobility, the power conversion efficiency of the resulting solar cells is limited by the low fill factor. In order to study the loss mechanism of the photo-current, we carried out transient photo-voltage (TPV) measurements to probe the bimolecular recombination of photo-carriers under open circuit condition. Based on our photo-CELIV (carrier extraction by linearly increasing voltage) data, we found that the carrier recombination rate is strongly related to the energetic disorder of the semiconductor polymers. Finally, we will report on our recent progress of high efficiency polymer solar cells based on a low band-gap polymer having an alternating dithienogermole-thienopyrrolodione repeat unit (PDTG-TPD).